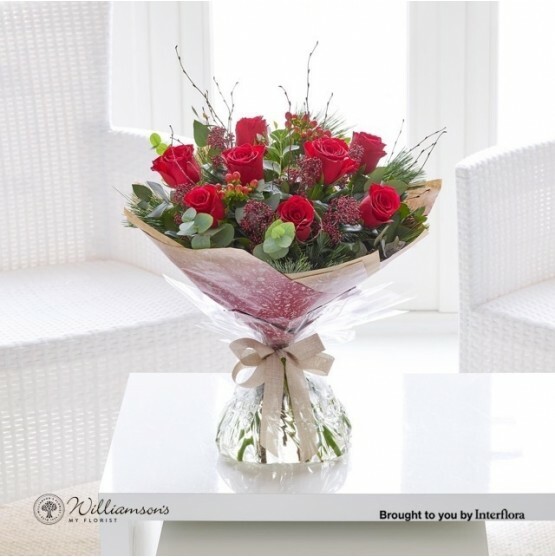 1: Professionally arranged by Williamson's award winning florist. 2: Beautifully presented and delivered by hand straight to the heart. 3: Add lots of exciting accompanying gifts when you reach our checkout. 4: In the rare event of substitution similar value or superior flowers shall be used. 5: Delivering the fresh of flowers since 1935 with freshness guaranteed for 7 days. 6: Same-day delivery to most mainland UK addresses is available on this item. Featuring red large headed roses, red hypericum and burgundy skimmia hand-tied with eucalyptus, birch and pine and finished with festive gift wrap and ribbon.